Soldiers will be safe from the “persistent human rights claims” that have dogged the British military for years because the Conservatives will “rip up” human rights legislation if they win the general election, two top Tories have pledged. Defence Secretary Michael Fallon called for an end to what he called the “abuse” of the Human Rights Act to bring about costly inquiries into the conduct of British soldiers during wartime operations in Iraq and Afghanistan. He warned that legal claims such as those emerging from the Iraq War had undermined the military’s work and had cost the taxpayer millions of pounds. The pledge reflects a broader Tory commitment to remove the UK from the European Convention on Human Rights (ECHR) and instead develop a British Bill of Rights in its place. It is said this would then govern the actions of UK troops on operations and take proper account of the pressures faced by service personnel in wartime if legal cases arise. Offering enemy combatants the right to sue the British government and expecting soldiers on the battlefield to operate with the same level of caution as police patrolling London streets will render future foreign combat operations unworkable, the report by Policy Exchange said. The British military establishment has been dogged by inquiries into allegations of human rights abuses on the battlefield perpetrated by UK forces. Although the Al Sweady investigation into allegations of murder and mutilation of Iraqis by British troops in 2004 found the majority of accusations “completely baseless” in December last year, there are still cases pending. 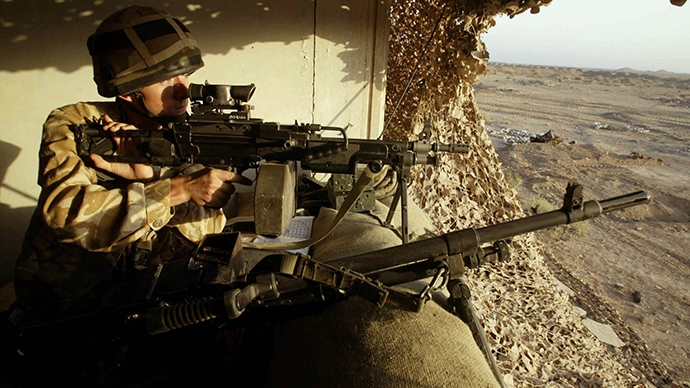 Last month, the High Court ruled that grieving families of Iraqis gunned down by British soldiers in Iraq may sue Britain’s Ministry of Defence (MoD) for violating international law. The milestone ruling could pave the way for over 1,200 claims, brought by Iraqi families. British law firm Public Interest Lawyers (PIL), which specializes in judicial review cases relating to human rights violations, would represent the claimants.